Joyce W. Cairns PRSA RSW Hon RBA MA(RCA) was born and brought up in Edinburgh. She studied painting at Grays School of Art, Aberdeen from 1966 -71 and The Royal College of Art, London 1971 -74. She was awarded a Fellowship at Gloucester College of Art and Design 1974-75 returning to London where she did the Art Teacher’s Certificate Course at Goldsmiths College, University of London 1975-76. 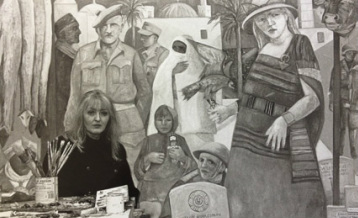 In 1976 she returned to Aberdeen where she taught Drawing and Painting at Grays School of Art until 2004 when she took early retirement to complete the vast body of work which culminated in ‘War Tourist’. It was exhibited for 3 months in 2006 at Aberdeen Art Gallery, attracting nearly 30,000 visitors. Her work is mainly autobiographical based on past memories intertwined with present experiences, woven around the backcloth of the once fishing village of Footdee at the mouth of Aberdeen harbour where she has lived for the past 33 years. ‘War Tourist’ was based on her Father’s war backed up by extensive research following in his footsteps through Europe and Tunisia . She now paints in Dundee working in a house and garden overlooking the Tay which will add a further dimension to her work but still retains a residence in Footdee. Joyce Cairns has been exhibiting since 1969 and her work is held in numerous private and public collections, both here and abroad. 28/11/20018 -Joyce has just been elected first woman President of the Royal Scottish Academy in 193 years. If you are interested in any of the work displayed on this web site please get in touch.